Native to tropical Africa and naturalized around the world. The Tamarind is an attractive tree valued for its shade and edible fruit. The foliage is bright green, dense, pinnate and feathery in appearance. The leaflets close at night. The inconspicuous ince-wide, five petaled flowers are borne in small racemes and are yellow with orange or red streaks. The flower buds are pink due to the outer color of the four sepals which are shed when the flower opens. The Tamarind is long-lived and slow growing. 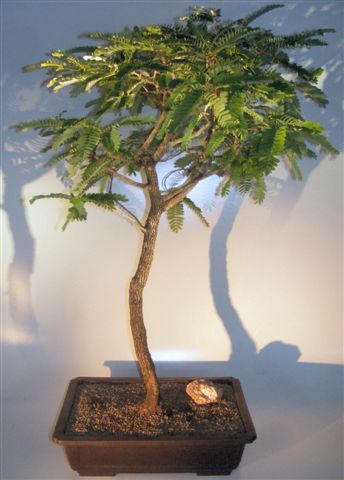 Prized as bonsai due to the very attractive rough bark that it develops. Makes a great indoor bonsai. 31 years old, 31" x 29" x 38" tall.